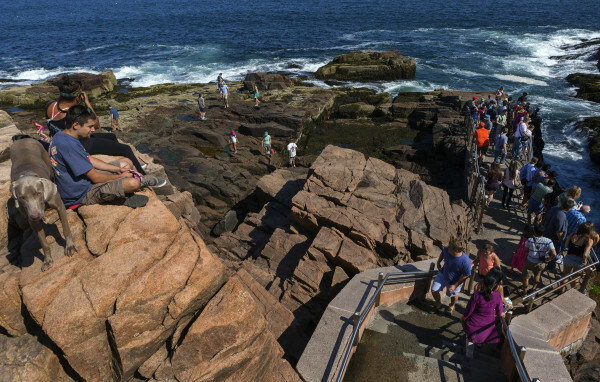 Acadia National Park visitors congregate at Thunder Hole, July 3, 2015. Park officials, hoping to clarify and simplify the process, this week announced new special use permit requirements for groups that gather in Acadia. ACADIA NATIONAL PARK, Maine — From now on, people who organize events in the park and have fewer than 21 people show up won’t need to worry about possibly getting a citation. At a public meeting Monday night attended by a handful of people, Acadia National Park officials made public their new requirements for getting special use permits for group activities in the park. The review of the park’s requirements for special use permits was prompted by a controversy that erupted in August, when an Ellsworth man who organized a group run of seven people up Cadillac Mountain was issued a citation for failing to get a permit. Park officials have been reviewing their requirements since then, with some input from runners and others who get together in Acadia, and decided to change several of them. In short, group activities by noncommercial users that involve moving from one place to another in the park, such as a run or a bicycle ride or even motorists, will require a special use permit if they involve more than 20 people. If it is a stationary event, such as a stargazing gathering or a family reunion at a picnic area, a special use permit will be required if more than 30 people attend. At Schoodic Point, which park officials try to keep less congested than park land on Mount Desert Island, 15 people is the maximum number allowed for an unpermitted moving activity, but up to 30 can gather without a permit for a picnic or other event at Frazer Point. Groups of 30 or more can meet at the Schoodic Education and Research Center, park officials said, but are required to make reservations through The Schoodic Institute, which manages the facility for the park service. Aaron Long, a Mount Desert resident who frequently runs by himself and with others through Acadia, said after Monday’s meeting he thinks the new requirements will make it easier for groups to know when they need a special use permit to gather in the park. He said he appreciates park officials’ efforts to clarify the rules and work with groups that use the park to make the permitting process easier to navigate. There are a variety of permits the park requires for certain uses — including weddings, commercial uses such as bus tours or guide services, or commercial photography or video activities — but it is group activities by noncommercial users, such as runners or stargazers, that have been scrutinized over the past couple of months. These uses, if conducted in large groups, generally require special use permits. For example, the Mount Desert Island High School cross-country team has a seasonal permit that allows the group to hold practices on carriage roads and certain trails in the park. Mike Madell, deputy superintendent of Acadia, told about 15 people who attended Monday’s meeting that, when it comes to managing park resources and uses, park officials often have to rely more on their own experiences than on hard data. In other words, it frequently is more of an art than a science. The deputy superintendent said the park does not have the staffing or the funding that would be needed to come up with empirical data on what size and type of group activities are appropriate in every part of the park. Madell said park staff wants to encourage people to use the park in appropriate ways, but they also have to protect the park’s physical resources. A key part of that, he said, is balancing out the increasingly myriad uses that are cropping up in Acadia so no one group or activity is having an undue effect on the park or on any other group or activity. Anyone in doubt about whether they need a permit should contact the park via email by visiting www.nps.gov/acad/, Madell said. Stuart West, chief ranger for Acadia, said that rangers will enforce the new special use permit requirements depending on how many people materialize — not on how many could have shown up. In the case of Andrew Kephart, the Ellsworth man who was cited in August for organizing a group run up Cadillac, only seven people who saw or heard of Kephart’s Facebook invitation appeared to participate. Rangers said at the time that Kephart was cited in part because his Facebook post implied that as many as 30 people might show up, which would have exceeded both the old and new special use permit requirements. West has since said that, because of the prior confusion over when such permits would be required and to help foster a cooperative atmosphere between user groups and park officials , he will recommend a dismissal for Kephart’s $175 citation. Dwight Lanpher, a Mount Desert resident who represents several stargazing and astronomy groups throughout New England, told park officials Monday that their members almost never meet in groups large enough to warrant a special use permit. But, he added, they usually attract other park visitors who see them with their telescopes and then wander over and ask to take a look. Lanpher said some astronomy groups — several of which help the park stage the Acadia Night Sky Festival every September — have canceled some informal night sky viewing events in Acadia because they were concerned the added impromptu viewers might result in a special use permit being required. The $50 permit processing fee is expensive as it is, Lanpher said, and no one wants to incur the cost of a fine. Madell and other staff told Lanpher that other visitors who spend three minutes looking through a telescope would not count toward the astronomy groups’ attendance totals. Plus, because of the quasi-volunteer role the astronomy groups play by educating other park visitors about the night sky, there are other park policies that likely would eliminate the need for a special use permit — even though park officials said they still would want to know about the groups’ gatherings so park staff can make sure something else isn’t already scheduled to take place where the astronomy groups want to meet. Park officials added that groups who want to meet in the park on a regular schedule such as once a month can get a permit that is good for a season or for an entire year. That way, the group has to pay the $50 processing fee only once on an annual basis. West said that, with the recent update of the special use permit requirements, Acadia officials are hoping that the rules are simpler and easier to understand. But, he added, educating park visitors who come from all over the country and from overseas about when permits are required likely is going to remain a challenge. Acadia National Park is open to everyone, West added, but park officials especially want to make sure regular visitors to Acadia feel welcome to come back time and again to have fulfilling outdoor experiences.